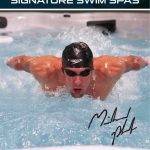 Welcome back to the final posting of Michael Phelps’ signature analysis. Today I will show you, the stroke that reveals the writer who possesses an undefeatable spirit when it is coupled with other factors in the handwriting. In my online home study course, there is an entire section on “ending” strokes, or final strokes as they are also called. 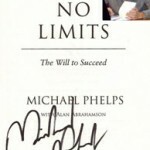 I will show you an important one today, that is in Michael Phelps’ signature. You want to pay attention to how the last letter of a word ends or finishes. When you see a stroke that ends with a long 45 degree angle in 50% or more of the handwriting, this writer possesses a winning outlook to life. They meet all challenges bravely and with courage. They have the attitude of “There are no problems there are only solutions.” That is a direct quote from my online home study courser for this particular stroke. And he fits this to a “T”. Look at the tail end of the letter in the word, Phelps. See how it veers upward at a 45% angle? It’s no coincidence that Phelps grew up hearing his mother always saying to his teachers, “What are you going to do about it?” whenever a teacher would try to put the lid on Michael Phelps with his “learning disability” of A.D.D. She put them to thinking of a solution, instead of leaving him stuck. And there are examples after examples where she did this herself at home, as he was growing up. His signature shows that he has indoctrinated that consciousness, that way of thinking. I could write for days on what I see in his signature but this is a blog post, not a book. In fact, please be aware that no one can ever be fully analyzed by their signature alone. However what shows up in the signature packs a punch! One final tip before I leave you today……notice how in this signature of Phelp’s that it looks like he has written on a ruler? Now you know, whenever you see handwriting that looks as if it were written with a ruler, you can be assured, that writer is a perfectionist. Handwriting is an ancient science that has truly stood the test of time. It is a enchanting study of human nature. We all have good and “Un-good” in our handwriting. It’s fascinating and an honor to take a look inside the mind of an Olympian Gold Medalist! We salute you Michael Phelps. Click here if you would like to find out more about the RMGA home study course.